I love tortellini salad. It is a nice change from a traditional macaroni salad. Easy pasta salad recipes are perfect for a summer barbecue, picnic or an any time of the year salad recipe. They work perfectly on a buffet table too. This is a great recipe to learn how to make pasta salad delicious every time. Boil the tortellini for the time specified on the package. Rinse them and cool a bit them before assembling the salad. Chop the broccoli into small flowerets and set aside in a bowl. Slice or finely chop the carrots and add them to the bowl with the broccoli. Dice the onion and red pepper and add to the vegetables. Grate the mozzarella cheese (keep apart from the vegetables for now). Using a wire whisk, in a medium mixing bowl, mix together the oil, vinegar, mustard, and 2 teaspoons of water. Add the remaining ingredients and toss to coat. Transfer this easy and delicious pasta salad recipe to a resealable container and refrigerate until you are ready to serve it. Instead of just slicing the carrots, I think the salad is nicer if the carrots are finely sliced and chopped into small match sticks, or coarsely grated. That way you don’t have large chunks of hard carrots mixed with the soft tortellini but you still have the carrot crunch and color. 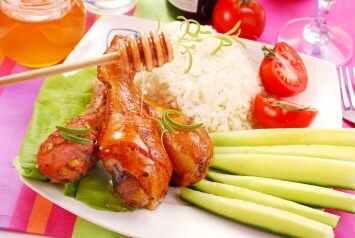 This recipe easily multiplies to serve as many people as you wish. The salad can be made several hours or up to a day ahead of serving it. The dressing is a vinaigrette with healthy olive oil, red wine vinegar and a bit of Dijon mustard. The mustard helps the vinaigrette to emulsify and hold together, as well as providing another element of great taste. 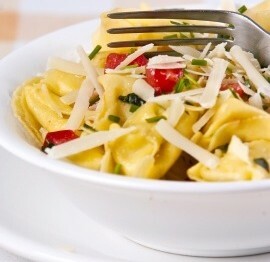 If you are not familiar with tortellini, they are little pockets of pasta stuffed with either cheese or meat. This recipe calls for the cheese version but you can certainly opt for the meat if you prefer. I like the cheese tortellini in this pasta salad because it is nice and light. It is a perfect accompaniment to a vegetarian main course, or pair it with your favorite meat recipes. Tortellini salad is a version of pasta salad, but it is just a bit different and a refreshing change from that or traditional macaroni salad. Our tortellini salad recipe is just one of our amazing salad recipes. Look here.